May 5 – Torrential rains kept the crew indoors for most of the day, and work on the ship was limited to pumping out the rainwater. The heavy rains suggest that the southwest monsoon is beginning, and are a hopeful sign that the Jewel of Muscat will set off with favorable winds once the new masts are in place. The masts will arrive at the harbor on Saturday, May 8th, and our new departure date is May 15th. 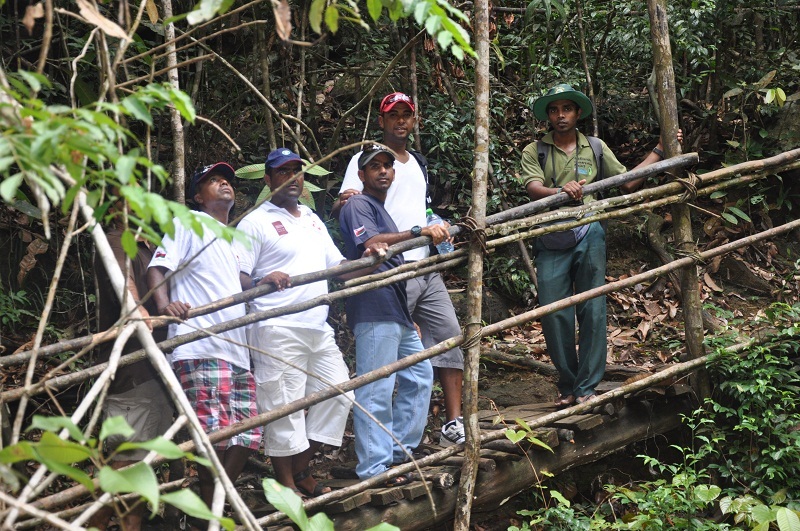 May 6 – Six members of the crew enjoyed a visit to Kanneliya Conservation Forest located about an hour and a half east of Galle. The forest came under government protection ten years ago and has since become an important center for international biodiversity research. Led by a young and extremely knowledgeable conservationist named Vishan, the crew members enjoyed a relaxed, two-hour walk through the rainforest. Vishan’s well-trained eyes enabled him to spot a variety of interesting plant and animal species despite the dense vegetation and deep shadows of the forest. Some of the highlights included a carnivorous pitcher plant, magnificent teak and mahogany trees, several types of chameleon, snakes, butterflies, bats, and beautiful birds such as the grey hornbill and Sri Lankan blue magpie. We especially enjoyed watching purple-faced leaf monkeys gamboling in the tree-tops. May 7 – Approximately twenty-five students, teachers and parents from the Thomas Gall International School visited the Jewel of Muscat this morning. (Note: The school was mistakenly referred to in a previous log as The Galle International School.) Everyone asked interesting questions about the ship and its voyage, and many of the older students put considerable effort into sketching the ship as part of a combined art and history project about Indian Ocean trade. A group of crew members enjoyed a morning visit to the Maritime Seamen’s Training Institute located next to the fort at Galle harbor. They were able to inspect the institute’s excellent facilities and watch the cadets engage in lifeboat and fire-fighting drills. The new masts should arrive tomorrow morning–at which time a great deal of work will need to be done to remove the old masts, install the new ones, re-do all the rigging, and generally prepare the Jewel of Muscat for her departure on May 15th. Future logs will keep you informed of these activities. Before signing off today, I should like to write a few words about Galle, our current home away from home. Since our arrival here on April 19, we have used our off-duty hours to enjoy sampling different restaurants, strolling through the old Dutch fort, visiting the Maritime Museum, and jogging along the beach at dawn. We have also enjoyed the warm hospitality of the staff of the Closenberg Hotel–and the hotel’s delightful setting overlooking Davata Bay. Standing on one’s balcony at night with the coconut trees silhouetted against billowed, moon-lit clouds, or watching the morning waves foaming onto the beach of the fishing village of Davata, one cannot help but marvel at the splendor of Sri Lanka’s coast. But intimate proximity to the ocean also means that this tropical idyll is vulnerable to the sea’s ever-changing temperament. The residents of Galle and Davata experienced this vulnerability on December 26, 2004, when a sub-oceanic earthquake near Indonesia triggered a massive tsunami (tidal wave) that slammed into Sri Lanka’s eastern and southern coasts causing the loss of tens of thousands of lives, countless injuries, and deep emotional trauma. Galle and its environs were among the hardest hit of the southern coastal towns and, although the homes, shops, and offices have now been rebuilt, memories of that terrible day are still fresh in the minds of all residents. Mr. N.P. Upasena, who lives in Galle and who lost several members of his family, pointed out to me the spot where he was riding his motorbike when the tsunami struck. Swept half a kilometer inland by the rushing water, he saved himself by grabbing a tree limb and climbing high enough to keep his head above the torrent. Today, as one walks the busy streets of Galle or strolls along the beach admiring the colorful fishing boats, it is hard to imagine the devastation wrought by the tsunami only five and a half years ago. The city’s recovery is a testament to the massive relief and recovery operations undertaken by the Sri Lankan and foreign governments, international aid agencies, and private donors–but mostly to the courage and resilience of the people of Galle.